Wow! What a week we’ve had! Is anyone else tired? I might have been ready for bed by 7 pm on Thursday night–but no, I didn’t actually do it. Lasted until 9. Man–these little ones keep you on your toes! 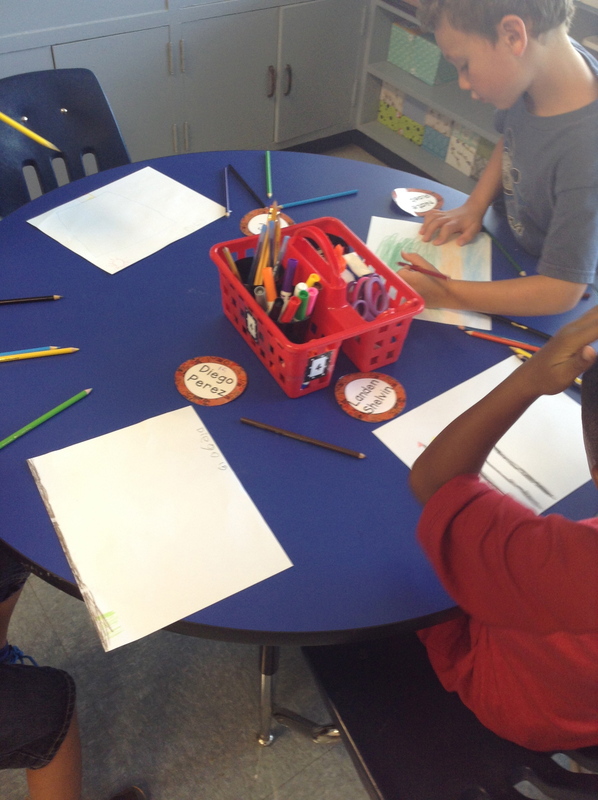 Students will learn each others’ names (and mine, too! ), as well as learn one thing that a friend likes to do outside of school. 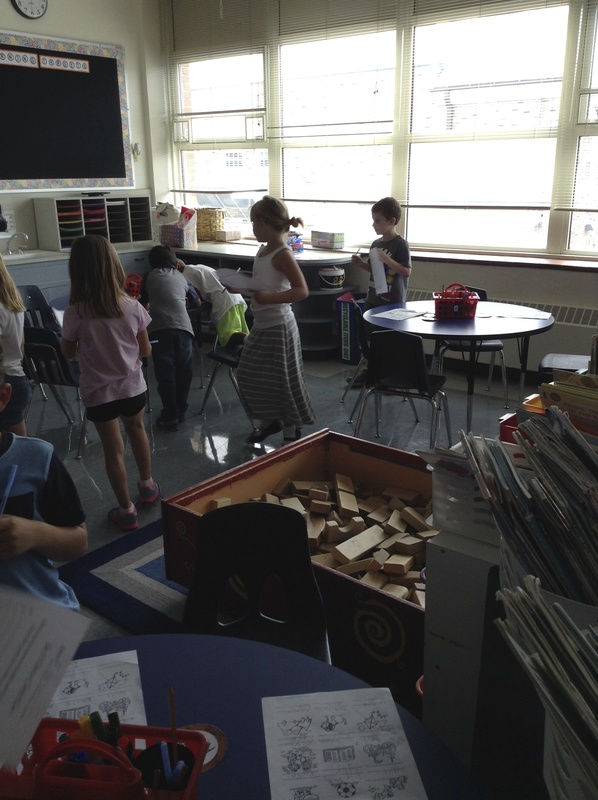 Students will learn–and then practice–the expectations for how our room will run. Students will be guided through discoveries of some key materials in our classroom that they will be using on a regular basis later on. Students will present their work to the class (in a whole group, small group and partner setting). Students will begin the year having fun and seeing our classroom as a positive, happy place to learn and grow! All that being said, there were MANY things we did this week, and honestly I do not have pictures or videos of them all. (As a side note, I’ll add in a quick observation here: first graders do so many more things in the first week than fifth graders do! The number of activities and directions you prepare for each hour of the day with 6YOs is SO MANY MORE than when you have big kids. That’s probably an obvious statement, and even one I knew going in, but I was definitely reminded of it very quickly this week. Like by lunchtime on Tuesday. 🙂 ). Much of our days are spent learning about where things are, how move around the room, how we sit on the rug, how we each take a turn during conversations, how we come into the room in the morning and get started, how we walk in line–you get the idea. These kiddos have been doing a super job of showing what they know from kindergarten and then adding in the “first grade version” of the routines. We’ll keep working this week as we continue to add new things/places to our repertoire. Supply caddies are kept on the windowsill when we’re not using them. Picture to remember what caddies are supposed to look like! Everybody has a hook with their class number on it so they know where to find their things, as well as a special spot on the bulletin board with their number, too! Special signs hang on our door to remind us of what to do in the line. Hall passes are on magnets and hang next to the door and sign-out board (thanks for the idea, Mrs. Appelbaum!). We got started on a chart to remind us of carpet rules. We’ll add to this in upcoming days. One way I introduce kiddos to the materials in our room is through guided discoveries (which is an idea put forth in the book The First Six Weeks of School, full of SUPER ideas to start the school year). So far, we’ve investigated Power Polygons (which will be used in a variety of ways in Math), colored pencils (which will be utilized on almost a daily basis, and are organized in a special way), scissors and glue (because you know that could be a trip to CRAZYTOWN if we didn’t learn to use those appropriately!). 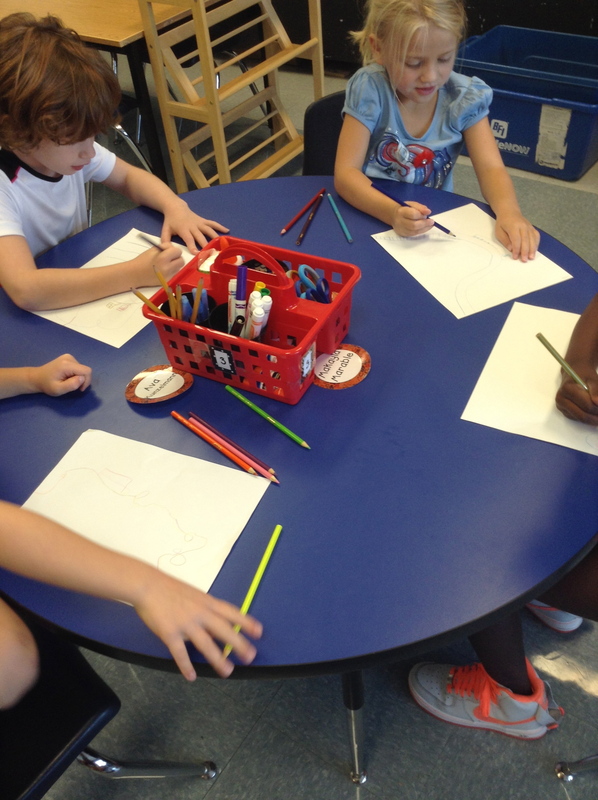 For our guided discovery with colored pencils, we spent a good chunk of time upfront talking about what they noticed about HOW the pencils are organized, WHY they are like that, and WHY it is a must that we keep them that way. I was really proud that once we were finished, all the pencils were back in the right cups! Way to go, first grade! For the guidance on this discovery, they were asked to create a picture of their favorite place to be, using as many details as they can–so that someone else could imagine being there, too. 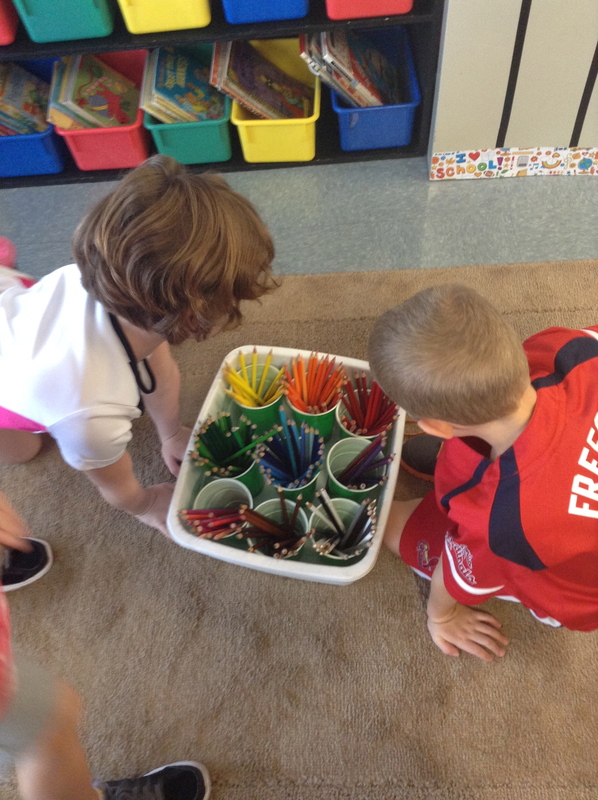 Friends work together to find the pencils they want. 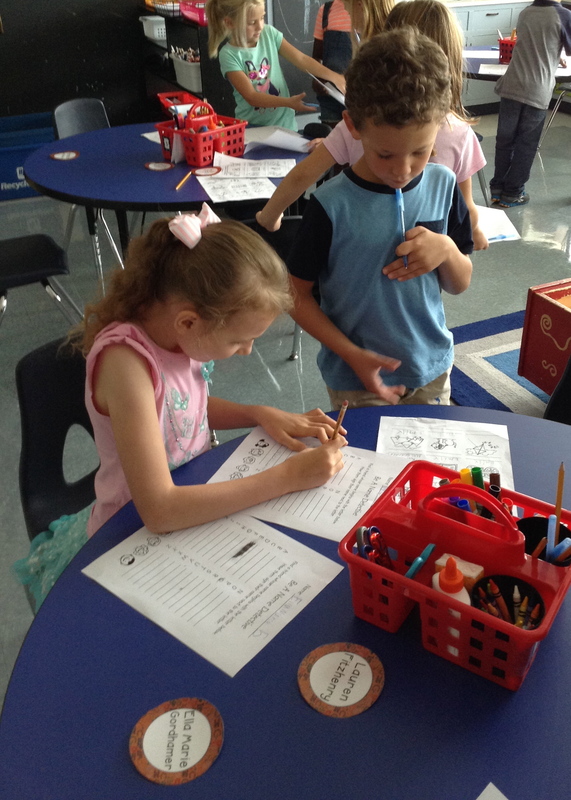 Friends at Table 4 get started thinking about the place they will create during their discovery. 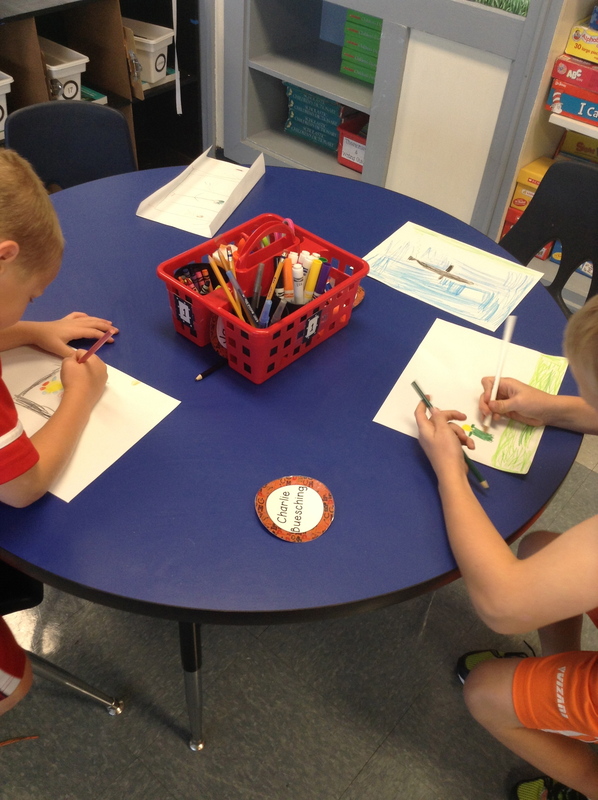 Lots of friends at Table 3 chose Six Flags as their favorite place to be. I saw lots of roller coasters and a huge Ferris wheel, too! The last discovery this week was with glue (we did briefly talk about scissors, too). We read the book Too Much Glue, and practiced the sayings “Just a dot, not a lot” and “glue raindrops” instead of glue puddles that turn into muddles. Then they got busy creating a flower to represent the many ways they will grow this year. We’ll go back and add their pictures to the middle later, as well as a goal for a way they want to grow. This was an activity for fine-motor development as well as art, as they crinkled the tissue and put it just where they wanted it on the glue dots. This week we had many opportunities to share our work and start developing the skills needed to be effective speakers and listeners. We did this in whole group, small group and partner situations. 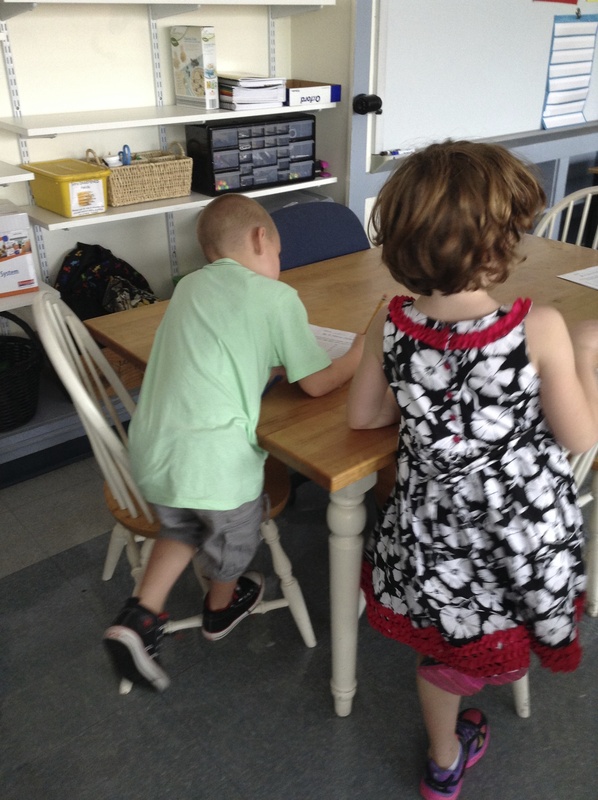 I’m already impressed with how these kiddos can turn-and-talk to their partners (we call it EEKK, eye-to-eye-knee-to-knee) and keep their conversations going. We read this book together on the second day of school, and reflected on our first day. then got EEKK with their partner…. and shared what they had written. 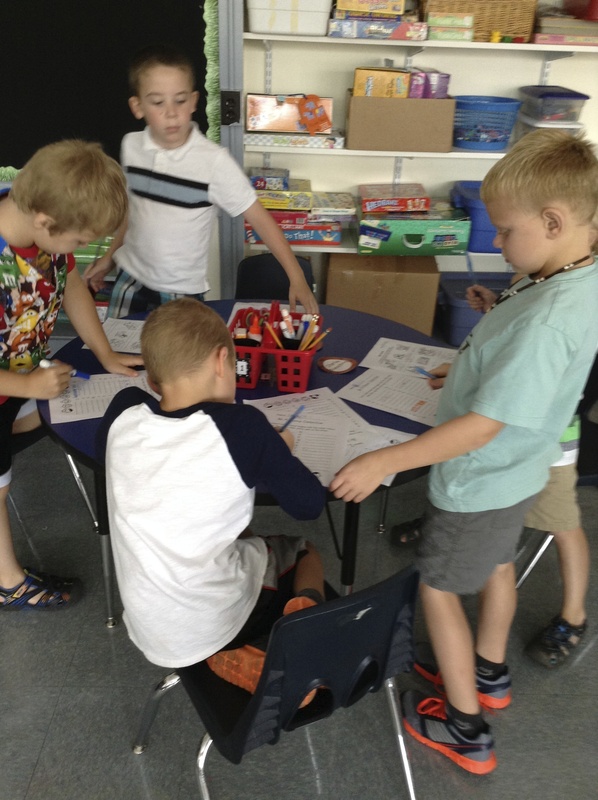 After our colored pencil guided discovery, kiddos had to share with their small group at their table and tell about the place they chose and why they chose it. 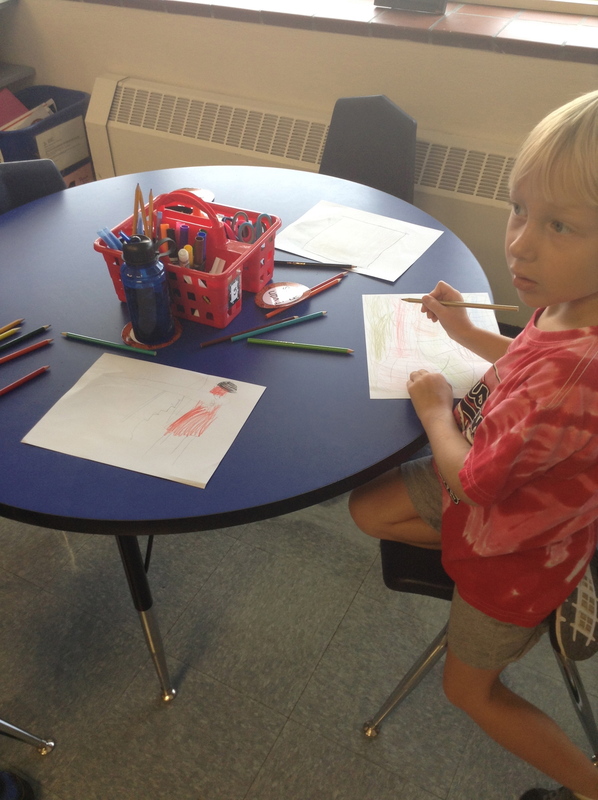 Then, after an activity based on a book we read called David’s Drawings, we shared whole group. Kiddos also took a few minutes to share their first creation with Power Polygons. They answered the question “What do you like best about your work?” It’s great to see the skills that these friends are coming in with from kindergarten, and how proud they are to share what they’ve created. Can’t wait to see them continue to grow in this area! Ok, one last video. It’s related to that last goal of having fun and seeing our classroom as a great place to be. While I hope that everything we do makes them feel that way, I know that when I first told them we’d have a dance party there was definitely a BUZZ in the room! Check us out as we move and groove. And while you can’t quite see it yet in this video, we are working on moving our bodies in responsible, controlled ways. We have 4 rules for when we dance: 1) Keep your feet on the floor, 2) Move your body the whole time, 3) Keep your body movements to yourself, and 4) Keep your voice at a level 1 or 2 so we don’t disturb others’ learning. I should also mention that besides just being fun, dancing allows us to release energy, work on self-control, and will also help us make sure we’re working on gross-motor movements that then lend themselves to other skills (like crossing the mid-line). We are definitely very purposeful in all that we do in Rm. 202! Ok….so I guess it did kinda turn into a big long list ‘o things, but I’m not sure that could be helped. 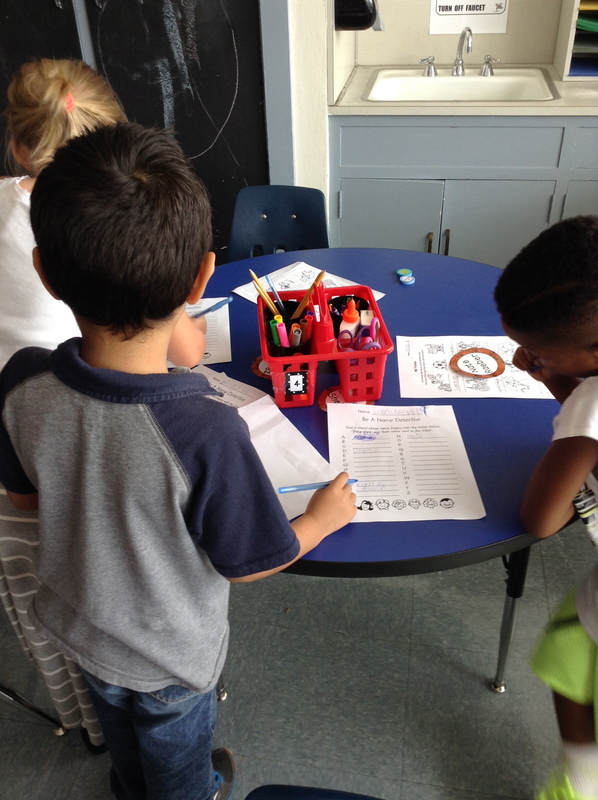 The first week is always like that–I want to make sure you know all about the great stuff happening in our room! After this one, I’ll be better able to highlight certain things, focus in on the methodology behind it and the ways that our work influences our growth as learners. I hope you’ll be along for the ride! Posted on August 24, 2014 by Jen Bearden	• This entry was posted in Classroom, First Grade, Math, Read Aloud, Reading, Social Studies and tagged beginning of the year, first days, first grade, fun. Bookmark the permalink. Wow! Your week was JAMMED PACKED with first grade fun and learning! Love the dancing ~ we can learn a lot from 6YO’s who cut loose and cut a rug with no worries or cares about who is watching! Keep up the powerful blogging!